This is a reprint of the Letter from the Editor from Unwinnable Monthly #104. If you like what you see, grab the magazine for less than ten dollars, or subscribe and get all future magazines for half price. Welcome to the June issue! We’ve mostly gotten back to normal after last month’s Mass Effect free for all. Shall I give you the tour? 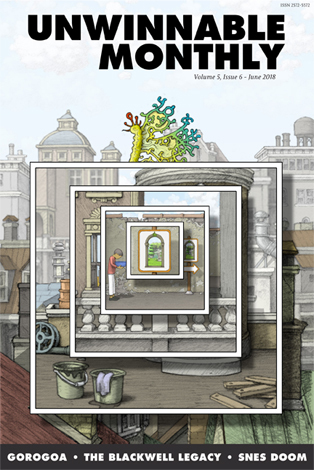 As you might have guessed from our cover art, our main feature, by Rachel Watts, tackles Gorogoa and how it uses the idea of the frame to tell its story and warp our perceptions. The cover art is straight from the game and was assembled by its designer (and illustrator) Jason Roberts. Jason was also kind enough to be our Artist Spotlight this month. We have two other features. The first is a fascinating essay by Alyssa Hatmaker on the Blackwell adventure games, Joseph Mitchell, Joe Gould and New York City of the 50s and 60s. Following that, Ben Sailer takes us back to one of his favorite games he never wants to play again: Doom, as ported to the Super NES. Our sponsored feature this month tackles the forthcoming Mothergunship, a wild FPS bullet-hell game from the designer of Tower of Guns. Our regular columns are mostly back in order. The exception is Documentary Sunday. While I left it named such in the table of contents, Megan Condis delivers what is essential a fifth feature, an interview with Dr. Melissa Littlefield about wearable technology and our understanding of the brain. The rest of the columns are quite a bit shorter. Gavin Craig delivers a poem about moving. Astrid Budgor serves up a new batch of metal for you to rip into. Brock Wilbur makes the unlikely addition of the NES version of the Home Alone videogame to his series on survival horror. In another weird twist, Deirdre Coyle can’t get a date to the Monster Prom. It keeps getting weirder, folks. Matt Marrone buys a record he already owns, then buys it again. I argue that the vampire at the center of Vampyr isn’t the sort of vampire you think he is. Sara Clemens claims that summer is the best time for mysteries while playing a mystery game set in the winter. Adam Boffa, meanwhile, breaks down the radical politics of Infinity War that will be radical only until the sequel comes out next year. We have a couple of straight forward columns, too. Yussef Cole listens to the whispered stories away from the main action of Destiny 2 (and in doing so, almost gets me interested in playing it) and Rob Rich shouts his love for the new iteration of Lost in Space to the stars. Stay cool and read well. We’ll see you again in July.